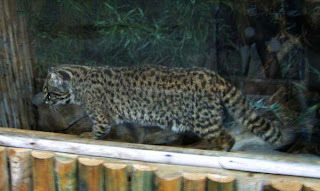 The Kodkod (Leopardus guigna), is found in central and southern Chile and Argentina. Guignas inhabit the moist temperate forests of the southern Andean and coastal ranges of Chile and Argentina. They occur to the treeline which ranges from 1900 to 2500 meters altitude. Most kokods have been recorded from the temperate moist Araucarian and Valdivian forests. Valdivian forests are characterized by a multi-layered structure with a bamboo understory and an abundance of epiphytes and lianas. Guignas also seem to be tolerant of disturbed habitats, they have been captured in settled and cultivated areas and in secondary forest and shrub. Guignas are most common on Chiloe and Guaitecas islands. Guignas are small felids measuring 58.5 cm to 68 cm in length, including the tail. They are the smallest cat species in the western hemisphere. They are buff or grey brown in color. Kodkods are marked with round blackish spots on upper and lower parts, with some black streaking on the head and shoulders. The tail is narrowly ringed with black color and the backs of the ears are black with white spots (Alderton 1993). There is a high incidence of melanism, which seems to increase with latitude. 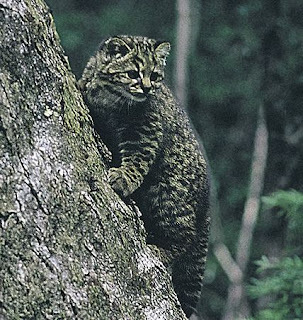 Guignas may be a subspecies of Geoffroy's cat, Oncifelis geoffroyi. Almost nothing is known about the reproduction and growth of kod kods in either the wild or in captivity. A typical litter size is two or three offspring. Reproductive maturity of one female was attained at 24 months of age. Guignas are nocturnal and highly arboreal, taking to the trees when pursued and to rest. It has been suggested that they are social and live in packs but there is no evidence for this assertion. Little is known about their prey, but guignas are known to eat small mammals and birds. There is at least one report of this species raiding chicken-houses in groups, but this is not verified and is considered unlikely to be common by some experts. Guignas were once common but habitat loss has led to population declines, particularly in the northern areas of their range where human populations are highest. Populations in the southern parts of their range may be protected because these areas are heavily forested and sparsely populated. 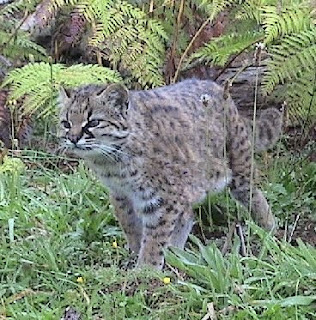 These cats may continue to thrive in areas of altered habitat such as pine and eucalyptus plantations, however, if prey populations continue to do well.